In a bid to improve uptake in an established indication, our client needed to re-engage with key stakeholders and communicate product value in the most compelling way. 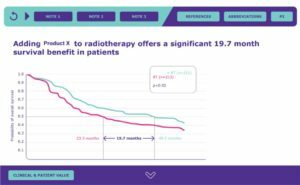 Having previously developed the updated value messages for our client’s oncology treatment, we were well placed to advise on the best platform for them. A logical progression through key value messages with the option to intuitively navigate through different pathways based on consumer needs. Links to supporting evidence including clinical trial designs. One-touch access to references, abbreviations and other useful information. The finished product was an easy-to-use, eye catching and informative tool, fully tailored to the client’s needs from both a technical and company branding perspective. The de‑centralised nature of the app meant that future changes could be incorporated with minimal hassle and easily adaptable to different markets. We helped to rejuvenate an aging brand by changing the approach by which payer discussions were held and improving payer interactions. Once approved, the tool was immediately up and running and being used by our client’s in-field market access team.